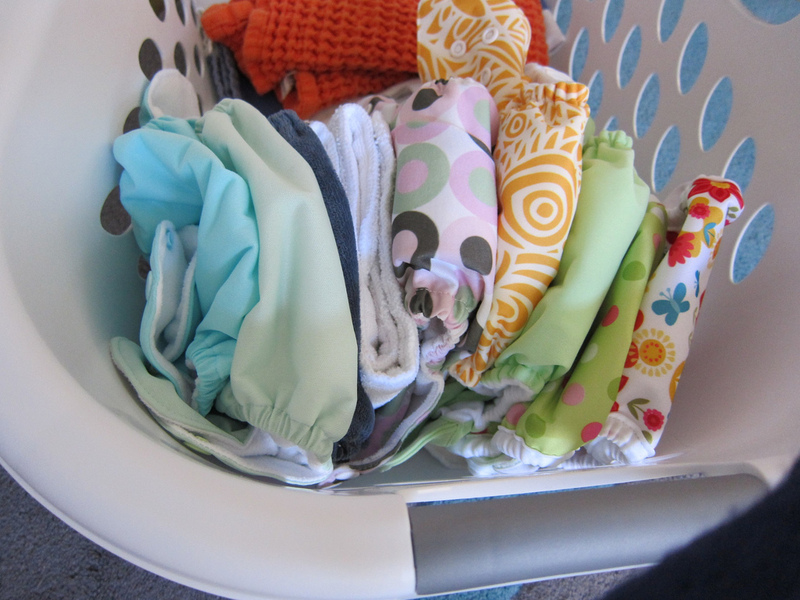 If you're used to disposable diapers, switching to cloth diapers can seem intimidating. There are so many choices of different types of diapers, and so many opinions about which is best. And once you've chosen the right diapers, you have to figure out how to wash them correctly to avoid repelling, leaks, and stains. You have to figure out what to do with soiled diapers when you're out of the house and how to find a cloth diaper that will work at night. When you discover all the things there are to know about cloth diapers, the mere challenge of washing poop seems like the easiest part about cloth. But despite the fact that there are hundreds of sites eager to offer you expert advice on everything from wool to wet pails, the reality is that using cloth diapers isn't rocket science. Most of our grandparents used them and never questioned them. And you know your grandma isn't a rocket scientist. So if you want to use cloth, don't stress about all the choices. Keep it simple, and remember that there's no wrong choice--only a choice that works for you. 1. Choose the right type of diaper (and don't be afraid to experiment). Sure, it can be overwhelming to figure out the differences among all-in-ones, pockets, and origami flat folds. But once you get the basics down, you'll discover that choosing the right cloth diaper isn't that much more complicated than choosing a brand of disposable diaper. After all, there are just as many differing opinions about disposables: one family swears by Huggies, while another is perfectly happy with Costco brand. The reason why different diapers work better for different babies is the same no matter what kind of diaper you're talking about: all babies are different. They have different builds, different anatomy, and they tend to sleep in different positions. This is actually one of the advantages of cloth: with so many options, it's practically guaranteed that one of the options out there will work perfectly for your baby. So don't give up if you try one type and it doesn't work--there are plenty more possibilities out there. And don't invest a lot of money in one type of diaper until you've figured out a kind that really works for you. Get a trial pack or borrow a selection of diapers from a friend. Then, once you have a system you like, you can invest in a complete set. 2. Prep them right. The idea that you have to do something to new diapers before you use them may seem weird if you're used to pulling disposables straight out of the box and slapping them on your baby. But you're probably used to washing new clothes before you put them on your baby, simply for sanitary reasons. Cloth diapers are no different. All cloth diapers should be washed at least once before use, but some need a few extra washes to "prep" them before they become absorbent. Generally this extra step is only necessary for cotton diapers: the natural oils on cotton need to be washed away before they'll absorb effectively. If you don't prep your diapers adequately, they will leak. Check with the manufacturer on how to prep your specific brand of diaper--most explain it clearly on their website. If you're not sure, ask the store where you bought the diapers. 3. Use them right. Using cloth diapers isn't necessarily any more difficult or complicated than using a disposable diaper, but you do still need to make sure you're using it correctly. First and most important is a proper fit; cloth, just like disposables, will leak if the diaper doesn't fit correctly. If urine is leaking around the legs, then the diaper may be too big; if poop is leaking out the back, then it's probably too small. With cloth diapers, it's easy to be certain about fit: most manufacturers list the specific measurements for each size (which is better than just a weight limit). Diaper sizes include three measurements: the waist, the leg, and the rise. Measure your baby without a diaper: around his waist, around his leg where a diaper opening should sit, and from his belly through his legs up his back. These measurements will give you a more perfect fit than just his age and weight. Second, make sure you're putting your cloth diapers on correctly. This may seem simple, but there are a few mistakes that are easy to make--such as putting an insert in the wrong place (generally they go inside the cover, directly against your baby's skin, but microfiber pocket inserts slide into the pocket in the center of the diaper and can cause rash if they are left against your baby's skin). You'll also need to make sure you're closing the diaper correctly, especially with snaps: too loose a setting (a common mistake) will cause the diaper to leak. 4. Wash them right. Washing doesn't need to be complicated, and depending on the brand and style of diapers you choose, you may be fine using your regular detergent. However, for some types of diapers--especially those with synthetic materials like microfleece--some detergents can cause buildup, leading to repelling and smell. Which means your diapers would both leak and stink. Again, check with the manufacturer. And be aware that if you do have a problem, you may need to switch detergents (even if the detergent is recommended for cloth diapers). The particulars of your washing machine, the hardness of your water, and the sensitivity of your baby mean that a little experimentation may be necessary here as well. 5. Ask for help. If you have a problem with your cloth diapers, ask an expert. Most cloth diapering gurus (of which there are hundreds on the internet) are passionate about the topic and eager to help other families succeed with cloth. You may think your problem is strange and unique, but chances are that someone out there has had the same problem and figured out the solution. Before you give up on cloth, present your problem to an expert and ask for advice. 6. Finally, give yourself a break. Like everything else in parenting, cloth isn't an all-or-nothing proposition. You don't have to use cloth full-time to enjoy the benefits. Even if you only use one cloth diaper a day, you'll still save money, help the environment, and reduce your household waste. Try just using cloth when you're at home, or after your baby has had his poop for the day. You may soon find yourself wanting to use cloth more, but if you don't, that doesn't matter. What matters is that you make it work for you--which is something that anyone can do. Lisa C. Baker is a full-time mom and part-time writer in Atlanta, Georgia. She writes about green parenting topics at Organic Baby Atlanta andteaches workshops on cloth diapers and elimination communication. She's been a mom since 2008 and has never bought a disposable diaper; she hopes she'll never need to!